Eden Hazard is a famous Belgian soccer player, who is currently playing for Chelsea F.C and for the national team of Belgium. He is widely known for his defensive playing style as a midfield player. He is often described by his colleagues, coaches, and opponents as one of the best players in the world. In many instances, he has even been compared to players such as Cristiano Ronaldo and Lionel Messi. As of 2019, Eden Hazard’s net worth is roughly $100 million. Eden was born in La Louvière, Belgium on January 7, 1991, to two soccer-playing parents. His mother was a player for the Belgian Women’ First Division Team and his father played for La Louvière in the Belgian Second Division. Eden also has three other brothers who are soccer players. At age 13 he was discovered by a scout from Lille OSC and was sent to Lille in France to continue training at better facilities. After joining Lille in 2005 and training at their sports school for some time, Eden signed his first professional three-year contract in May 2007. He made his first professional debut in a game against Racing Club de France in September 2007. During the 2008-2009 season, he was promoted to the senior team manager and signed a three-year extension at Lille. His debut for the Belgian senior national soccer team was in 2008 in a game against Kazakhstan. He was later declared the very first international player to be named UNFP ‘Young Player of the Year.’ During the 2009-2010 season, he signed a contract to remain at Lille until 2014. In June of 2012, Chelsea officials made a deal with Lille to sign Eden to their team, and he then played his first game for the team a month later. During the 2014 World Cup qualification campaign he scored two goals in nine matches which helped his team get to the 2014 FIFA World Cup where they reached the quarterfinals and got eliminated. In 2015, Hazard signed a new contract with Chelsea for another five and a half years. During that same season, he won the ‘PFA Player of the Year’ award and Chelsea’s ‘Player of the Year’ award. As of 2019, Eden Hazard’s net worth is $100 million. Mistakes are human, and you can’t always do something about it. Sometimes even the smallest mistakes can bring us down even though they are in the past but, getting over them and growing because of them is part of progress and bettering yourself. Everyone messes up from time to time, and all you can do is learn to laugh at yourself and do better next time. We all experience ups and downs in our lives and sometimes no matter how big the downs seem, focusing on the ups will make you feel a million times better. We can’t get hung up on negatives because they hold us back and don’t allow for growth. Good things happen for a reason, and sometimes we need a reminder that it’s not always bad. Fear is repeatedly getting in the way of accomplishing goals and making dreams come true. Living a life filled with fear of ever venturing out and exploring is hardly a life worth living. Don’t let your fears dictate your life because you are capable of doing so much more. Eden Michael Hazard is one of the world’s best soccer players and has received many prestigious awards for all of his achievements. He has accomplished a lot in his career and is only 27 years old. Eden Hazard’s net worth is approximately $100 million, but he continues to play soccer and will substantially increase that amount in the years to come. 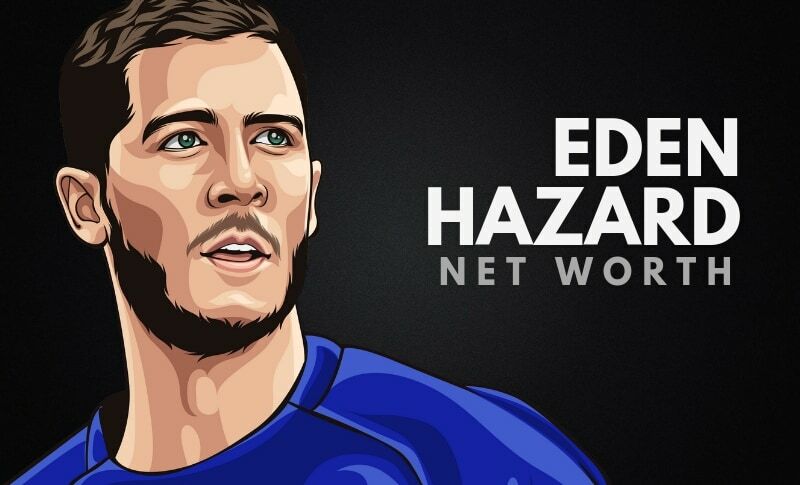 What do you think about Eden Hazard’s net worth? Leave a comment below.